Save now the Treasures all hidden. and fire and danger ring the Merlin’s nest. And bring the Treasures to a safer rest. Coll the young bard has a vision of danger and a mysterious high green hill. So on the morning after Wintereve he and his cheeky raven, Branwen, sail away from his home far in the north of Alba (that’s Scotland now) on a quest to find the hill and rescue the thirteen Treasures of Britain. Who will help him? Will the gods be on his side? And how will he escape the fierce raiders sailing to attack the Island of Britain? All is eventually revealed as Coll finds his way through the lands of Ellan Vannin, Eriu, Cymru, Armorica, Kernow and Dunein, not to mention the confusing mists of the Otherworld, telling fifty wonderful Celtic myths and playing his harp as he goes. And of course he has Branwen to keep him cheerful (and peck him when he’s not). 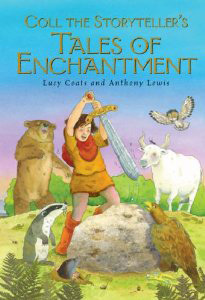 This book is in a similar format to Atticus the Storyteller’s 100 Greek Myths, so you can follow the separate story of Coll’s magical journey in words and Anthony Lewis’s great cartoons as you go through the book as well as having fun finding the real places he visits on a map of the British Isles. You can read an extract below. Sadly, this book is now out-of-print, but you can still find secondhand copies at online bookstores such as AbeBooks. I am a Celt by blood, and the stories of Finn and Cuchulain and all the heroes of this land are part of my heritage. I had a wonderful time wandering around all the parts of Britain (and I went to Brittany too), talking to all sorts of interesting people and finding sniffs and fragments of fabulous stories in all kinds of dusty old guidebooks and histories. A good few of these stories (especially the ones from Skye) have never been written down for children before—in fact the last time anyone heard them properly was probably orally, from a grandma or grandpa, and that would have been local to where they first came from. The map was just as much fun to do as the one for Atticus. I walked miles over Dartmoor to find Wistman’s Wood where I have sent Coll to find Merlin. It’s a really enchanted place with twisty trees all covered in moss, and great grey-green boulders scattered like a giant’s jackstones. Merlin wasn’t there when I visited, but perhaps he was just too well hidden for me to find. As for the Thirteen Treasures (or Hallows) of Britain—the easiest place to find a list of them is at wikipedia. All the places on the map have either a connection to the story, or there is evidence that a settlement would have existed there in the time of the druids. The best thing for me has been bringing all those ancient sites back to life. This is an extract from the beginning of Coll the Storyteller’s Book of Enchantments. 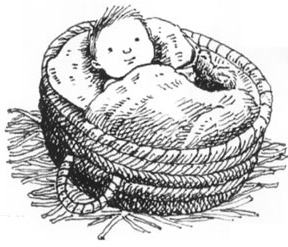 Just imagine Branwen as a baby chick. Bet she was cheeky even then! Long past long ago, behind the shadow mists of a thousand tales, the Islands of Britain floated on the edge of the world. They were lands of green hills and roaring seas, of soft sunshine and slanting grey rain, filled with magical oak groves and mysterious tall stones; where giants walked and fairies danced and seal-people sang amongst the waves. In those days enchantments lay in every clod of earth and grain of sand, and spirits of wind and water could be heard whispering in the sound of every breeze and ripple of every stream. And in a certain hollow green hill, guarded by Merlin’s spells, the Thirteen Treasures of Britain lay hidden . . . The centuries rolled by, and invaders came from oversea. Cruel wars were fought, cutting through the threads that held the enchanted cloth of the lands together. Little by little even the strongest magic weakened and was driven underground. Only the druids and the bards remembered, passing on the secret knowledge and teaching the old stories in schools hidden in faraway places where no one would find them unless they were meant to. And in a certain year, at the time when the sun was hot in the sky and the hazel nuts were ripening on the bushes, a baby boy named Coll and a raven chick called Branwen were blown by the winds to the island school at Callanish in Alba (which in these days we call Scotland). There they stayed for thirteen years…. When Coll sails over to Armorica (which we now call Brittany), in France, this is one of the magical people he meets there. Spooooky! “Hush,” say the fishermen in their boats at dusk, “hurry!” And they sail swift and sure for the safety of the harbour and home. For far out in the dark and the drift of the waves comes a howling cry. “I-ooou! I-ooou! I-ooou!” it goes, eerie and shrill as a seagull, a lonely, lost sound. And sometimes a sailor will sigh and stare, and turn his tiller for the open ocean, hearing words which draw him on, on, to the wrecking rocks and down into the deep. And there he will join Yann-an-Od, Lord of the Dunes, in his house made of bones and sea-wrack and shell, surrounded by whispering ghosts and mermaids, who feast on silver pilchards and rainbow mackerel stolen from the nets above. But at other times a sailor far out on the waves, lost and helpless in a storm, will hear in that cry a sound of hope and comfort, and he will see a green glow ahead. And an old man, sometimes giant, sometimes dwarf, but always dressed in black, will row in front of him and guide him safe to shore by the light of his shadowy lantern. It all depends, say the fishermen, on whether the Lord of the Dunes is in a good mood or not. “What an accessible introduction to Celtic mythology! Coll the Storyteller is a young bard on a quest. He must rescue thirteen sacred treasures and discover the resting place of King Arthur. On his journey, he and his companion, the raven Branwen, tell each other stories. And it is these which are the real treasures of this book. There are tales here from the Mabinogion, Irish myths, Arthurian legends, as well as stories from Scotland, Cornwall, Brittany and the Isle of Man. Some are well known, others less so. All are told in direct and immediate prose, illuminated with flashes of brilliant imagery. “This seems an ideal book for The Corncrake and for Colonsay since the name Coll is itself such an important one in THIS island’s life and history. Many local people are related to Coll or even descended from Coll!! Not this actual bard of course but this young storyteller does travel right through the Western and more Celtic fringes of the British Isles.